As seen on PBS — Light of the Valley presents the inspiring story of the 15th renovation of the Swayambhu Stupa in Kathmandu, Nepal, recognized as one of the most important stupas in the Buddhist world. Renowned for its great antiquity, blessings and power, this stupa has been worshipped continuously through the centuries by the people of Nepal and Tibet. It remains a focus of daily offerings, prayers and ceremonies today. In 2008, Tarthang Tulku Rinpoche sent his daughter, Tsering Gellek to Nepal to direct the renovation, a project that is traditionally undertaken once in a century. With the help of 70 skilled artisans, in less than two years the project was successfully completed. Guna Foundation has produced a 30-minute documentary, Light of the Valley, chronicling this momentous achievement. 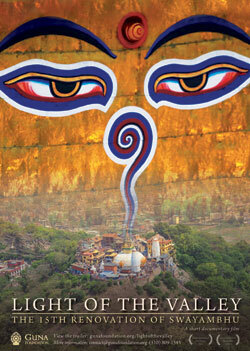 Light of the Valley reawakens an appreciation for sacred sites across the world. Since time immemorial, sacred sites have served as spiritual beacons to humanity, reminding us of our true purpose and potential in life. It is vitally important to maintain and protect sacred sites, for in preserving them, the precious knowledge of our human heritage may be preserved for generations to come.